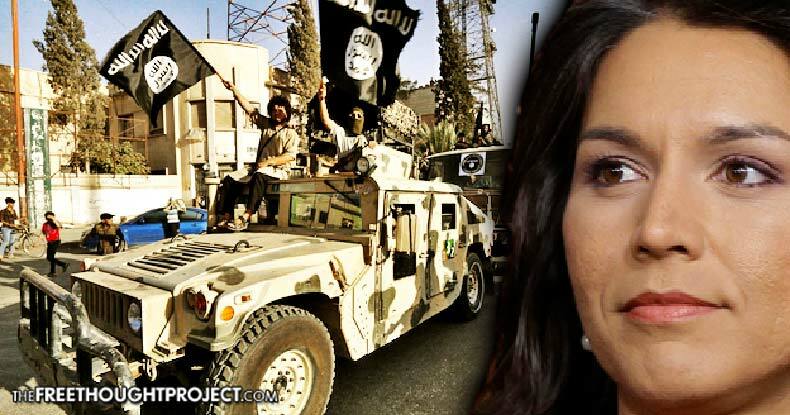 Congresswoman Proposes Radical Solution to Refugee Crisis, "Stop Arming Terrorists"
US Representative Tulsi Gabbard is proving to be quite the thorn in the side of the establishment warmongers. In January, Gabbard went on a secret trip to Syria to investigate first hand and to find the truth that the corporate media is covering up about the Syrian war. Since then, this brave congresswoman has remained steadfast in her mission to show Americans how their tax dollars are funding terrorism in the Middle East. In a press conference this week, Gabbard called on President Trump to “end the regime change in Syria,” adding that this is what is causing the refugee crisis. “The most important question is, how do we address the cause of these people fleeing their homes,” Gabbard stated before pointing to a bill that she’s submitted to Congress this year that would help in solving this problem. The bill’s premise to stop the refugee crisis is quite simple — stop arming the terrorists. “For years, our government has been providing both direct and indirect support to these armed militant groups, who are working directly with or under the command of terrorist groups like Al-Qaeda and ISIS, all in their effort and fight to overthrow the Syrian government,” Gabbard said in an interview Wednesday. As pro-war neocons — consistently beating the war drum in spite of never actually spending any time in the military — lash out at Gabbard for her Syrian trip and proposed legislation, other members of Congress, who’ve actually been in the military (like Gabbard), are showing their full support of the bill. Representative Tom Garrett (R-Virginia), a US Army veteran, is one of those supporters who said that the goal in Syria should be peace.